Figure 2. 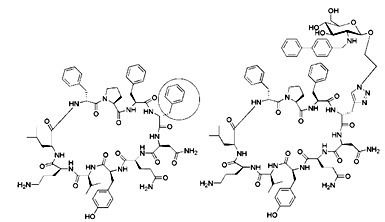 Tyrocidine and a triazole-containing glycosylated analogue. Figure 3. ABPP probes label active, but not inactive (e.g., inhibitor-bound, zymogen) enzymes in complex proteomes. Labeled enzymes are detected by in-gel fluorescence scanning and identified by affinity purification and MS analysis. 1. Q. Wang, T. R. Chan, R. Hilgraf, V. V. Fokin, K. B. Sharpless, M. G. Finn. Bioconjugation by Copper(I)-Catalyzed Azide-Alkyne [3 + 2] Cycloaddition. J. Am. Chem. Soc., 2003, 125 (11): 3192-3193. 2. C. W. Tornøe, C. Christensen, M. Meldal. Peptidotriazoles on Solid Phase: [1,2,3]-Triazoles by Regiospecific Copper(I)-Catalyzed 1,3-Dipolar Cycloadditions of Terminal Alkynes to Azides. J. Org. Chem., 2002, 67 (9): 3057-3064. 3. [a] W. S. Horne, M. K. Yadaf, C.D. Stout, M. R. Ghadiri. Heterocyclic Peptide Backbone Modifications in an Alpha-Helical Coiled Coil. J. Am. Chem. Soc., 2004, 126 (47): 15366-15367. [b] G. Zhang, L. Fang, L. Zhu, D. Sun, P. G. Wang. Syntheses and Biological Activity of Bisdaunorubicins. Bioorg. Med. Chem., 2006, 14 (2): 426-434. [c] D. Wang, J. A. Sutcliffe, A. K. Oyelere, T. S. Mcconnell, J. A. Ippolito, J. N. Abelson. Methods of Preparation of Bifunctional Heterocyclic Compounds for Use as Antiinfective, Antiproliferative, Antiinflammatory and Prokinetic Agents. 2004, WO 2004029066. [d] R. Srinivasan, M. Uttamchandani, S. Q. Yao. Rapid Assembly and in Situ Screening of Bidentate Inhibitors of Protein Tyrosine Phosphatases. Org. Lett., 2006; 8 (4): 713-716. 4. J. F. Lutz, H. G. Börner, K. Weichenhan. Combining ATRP and 「Click」 Chemistry: a Promising Platform toward Functional Biocompatible Polymers and Polymer Bioconjugates. Macromolecules, 2006, 39 (19): 6376-6383. 5. A. Deiters, T. A. Cropp, D. Summerer, P. G. Schultz, et al. Site-Specific PEGylation of Proteins Containing Unnatural Amino Acids. Bioorg. Med. Chem. Lett., 2004, 14 (23): 5743-5745. 6. Q. Wan, J. Chen, S. J. Danishefsky. A Potentially Valuable Advance in the Synthesis of Carbohydrate- Based Anticancer Vaccines through Extended Cycloaddition Chemistry. J. Org. Chem., 2006, 71: 8244–8249. 7. H. Lin, C. T. Walsh. A Chemoenzymatic Approach to Glycopeptide Antibiotics. J. Am. Chem. Soc., 2004, 126 (43): 13998-14003. 8. A. E. Speers, G. C. Adam, B. F. Cravatt. Activity-Based Protein Profiling in Vivo Using a Copper(I)- Catalyzed Azide-Alkyne [3 + 2] Cycloaddition. J. Am. Chem. Soc., 2003, 125 (16): 4686-4687. 9. [a] B. F. Cravatt, E. J. Sorensen. Chemical Strategies for the Global Analysis of Protein Function. Curr. Opin. Chem. Biol., 2000, 4 (6): 663-668. [b] G. C. Adam, E. J. Sorensen, B. F. Cravatt. Chemical Strategies for Functional Proteomics. Mol. Cell. Proteomics, 2002, 1 (10): 781-790. [c] A. E. Speers, B. F. Cravatt. Profiling Enzyme Activities in Vivo Using Click Chemistry Methods. Chem. Biol., 2004, 11 (4): 535-546.